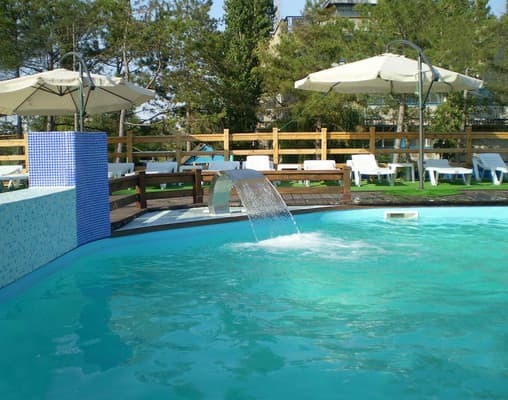 The recreation center "Mirage" is located in the resort area of ​​Koblevo - a picturesque corner of the Black Sea coast, 150 meters from the beach. Curative sea air and a gentle sandy beach create the most comfortable conditions for recreation for both adults and children. 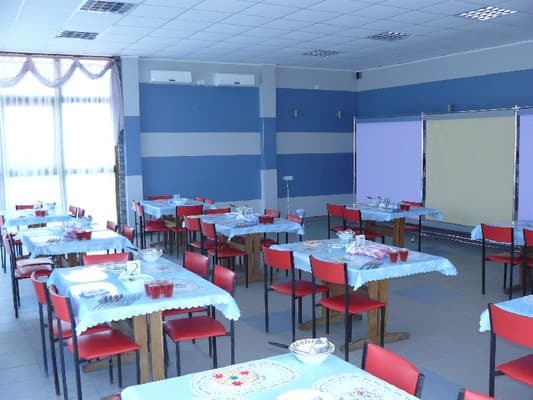 The hotel is a three-storey building, consisting of 32 rooms. All rooms are equipped with comfortable furniture, TV, free Wi-Fi access, have access to a spacious loggia. On the territory of the recreation center "Mirage" there are open adult and children's pools with fresh water, built-in Jacuzzi and hydromassage. 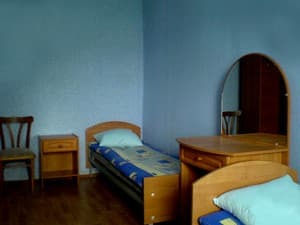 Description of the room: One room with an area of ​​11 sq.m, furnished with two single beds, bedside tables, table, chairs, wardrobe (or hangers). Each room has a large loggia. A bathroom (toilet, washbasin, shower) and a refrigerator are located in a block of two rooms. 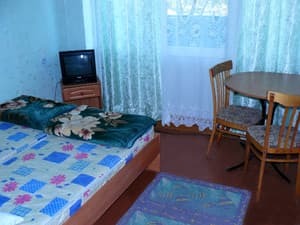 Description of the room: One room with an area of ​​15 square meters, furnished with three single beds, bedside tables, table, chairs, wardrobe (or hangers). Each room has a large loggia. A bathroom and a refrigerator are located in a block of two rooms. Description of the room: Block room, equipped with 4 single beds. Refrigerator and a bathroom in a block for 2 rooms. Description of the room: Two-room for 4 people. 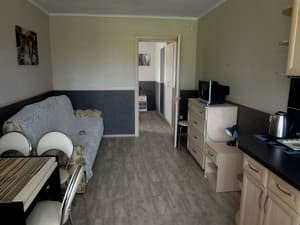 The room has a double bed, sofa bed, wardrobe, bedside tables, chest of drawers and other necessary furniture for comfortable living. Недорогой отдых, с удобствами, рядом с морем.Чистая, зеленая территория с беседками. Наличие хорошего, чистого бассейна с шезлонгами и навесом, наличие столовой с возможностью приобретения отдельно завтраков, обедов или ужинов. ненавязчивый персонал. Катастрофически не хватало кондиционера!!! Хотелось бы влажной уборки в номере, хотя бы раз в несколько дней. "Ценовая политика " в бассейне. Люди редко приходят в бассейн на целый день. Оплата производится за 12 часов- 50 грн., без вариантов((( Почему бы не разделить до или после обеда, или установить почасовую оплату. Check arrival: from 10:00 - 11:00 hours. Check leaving: to 09:00 - 10:00 hours. Children under 5 years old stay free of charge without extra beds, from 6 to 12 years - 10% discount. The cost of extra bed (folding bed) for an adult is paid separately. There is a dining room and a bar. The cost of a 3-off meal is 190 UAH. 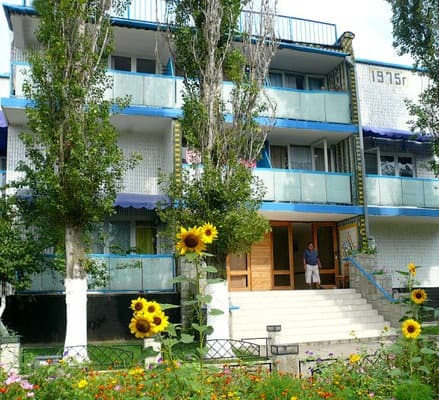 The hotel is located in the recreation area of ​​Koblevo, 150 meters from the beach. 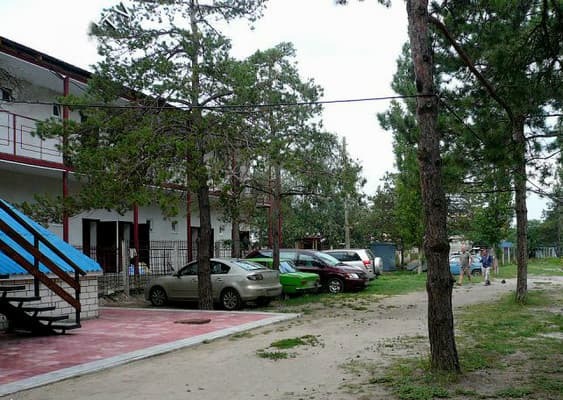 Distance to the city of Nikolaev - 83 km, Odessa - 60 km. Services of the masseur (service paid). From Odessa: shuttle bus "Odessa-Koblevo", from Nikolaev - "Nikolaev-Koblevo". The center of the village is 15 minutes away by car.